Malone starts off a pitiful 1 of 11 passing, but rookie CB Delton Hall scoops up a Roger Craig fumble and streaks 50 yards for a TD to set the tone. Montana struggles all day, throwing 3 INTs against a defense ostensibly made up of no-name players (rookie Rod Woodson doesn't play due to his holdout over a contract dispute). Montana throws for over 300 yards but the 49er ground game is non-existent with only 47 yards on the day. Meanwhile, the Steelers grind out 183 yards on the ground (Earnest Jackson 103 yds), keeping the ball away from Montana and Rice and physically wearing down the Niners. An admirable and surprising performance by a decidedly sub-par Pittsburgh team. 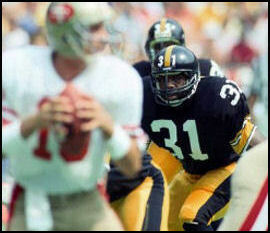 Mark Malone throws 5 picks, including 4 in the 2nd half, as the Steelers drop their 6th straight at Cleveland Stadium. Malone completes just 12 of 36 passes for 151 yds, no TDs and of course, the previously mentioned 5 INTs and was sacked 3 times before being replaced by Bubby Brister midway through the 4th quarter. Not all of the INTs were Malone's fault. With the game tied 10-10 in the 3rd, Lipps drops a pass that hits him right in the hands, bounces off his foot and goes right to a Browns LB for the INT. Five plays later, Bernie Kosar hits Gerald "Ice Cube" McNeil for an 11-yd TD that snaps the tie and the Browns go on to score 17 more points in the 4th quarter, including a 26-yd INT return for a TD by Clay Matthews. Thanks to Jay Korber for providing us with this game! Strike game! 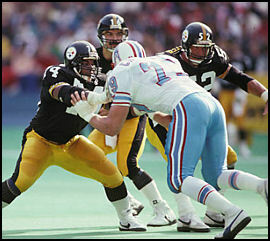 Steve Bono leads the Steelers at QB, Joey Clinkscales (???) 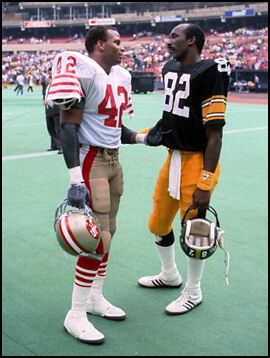 shines at WR (6 catches, 150 yds, 1 TD) and Earnest Jackson (the only other "regular" to cross the picket line with Mike Webster) carries 29 times for 104 yds and a TD. Defensively, Larry Griffin performs well enough at DB to earn a roster spot that he will keep for 7 years, intercepting a pass in the end zone to thwart an Atlanta scoring opportunity and setting up a Steeler TD with a 2nd INT at midfield. Not NFL-calliber football, but not bad for a group who only had 10 days to prepare. Marino hits 25 of 31 passes for 332 yards and 4 TD passes, including two 3rd-quarter bombs to Mark Clayton (41 and 33 yds, both vs. Dwayne Woodruff) and another to Mark Duper (50 yds), to give the Dolphins a 35-24 comeback victory. Pittsburgh builds a 21-7 first half lead courtesy of a 10-yd TD pass from Malone to Charles Lockett, a 50-yard pick 6 by Donnie Shell and a 1-yd run by Frank Pollard. But the Steelers can only must a Gary Anderson FG in the 2nd half as Marion lights it up, and a late Malone INT leads to a short Miami TD run to ice the game. A special thanks to Maurence Shipley for making this game available! Rod Woodson's first-ever game as a pro. 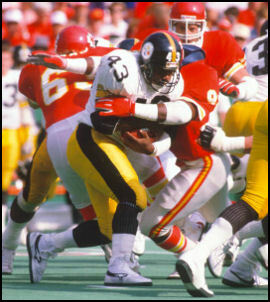 Pittsburgh plays an embarrassingly ugly game offensively, but the Chiefs play even uglier allowing Gary Anderson, thanks to a late fumble by Christian Okoye, to redeem himself for an earlier miss. Mike Merriweather (1 INT, 2-1/2 sacks), Earnest Jackson (23 carries, 125 yds) and Walter Abercrombie (16 carries, 98 yds) are bright spots for Pittsburgh, but the only thing more abysmal than Mark Malone's QB play (14 of 31, 157 yds, 2 TD, 2 INT, 1 fumble returned for a TD) is Bill Kenney's pathetic performance at QB for the Chiefs (14 of 29, 155 yds, 0 TD, 4 INT). Pittsburgh's defense, on the other hand, plays a fantastic game. Along with Merriweather's heroics, Thomas Everett steals an underthrown pass on the Pittsburgh 9-yd line and Dwayne Woodruff intercepts another on the Pittsburgh 3 and the Steelers hold KC without an offensive TD despite constantly having their backs agains the wall due to 4 Pittsburgh turnovers. A special thanks to Jay Korber for providing this game. The 7-3 Saints visit the 6-4 Steelers with both teams fighting for a playoff spot and the Saints hoping to secure their first-ever winning season. The Steelers lead 14-10 with 9 minutes left when Rod Woodson loses the rain-soaked ball on a punt and the Saints recover at the Pittsburgh 21. Two plays later, Bobby Hebert hits Eric Martin for the go-ahead TD. Less than a minute later, Mark Malone throws a costly INT that's returned to the Pittsburgh 12, and Morten Andersen kicks a 32-yard FG to give New Orleans a 20-14 lead. The Saints appear to have the victory clinched when Sam Mills stops Pollard on the 1-foot line on 4th and goal and instead of risking a punt from their own end zone, the Saints take a safety with 1:05 left. But in 55 seconds, the Steelers move to the Saints' 3-yard-line and are poised to win. Unfortunately, Pat Swilling sacks Malone with 10 seconds left and Malone's desperation pass is intercepted as time expires, Pittsburgh's 6th turnover of the game. A special thanks to Matthew Simon for generously providing this game. The Steelers turn back the clock, using a punishing ground game and a strong defense to beat Seattle and move into a 1st-place tie with Houston and Cleveland. Pittsburgh rushes for 209 yds, including 106 yds on 22 carries by Frank Pollard, who scores the winning TD on an 11-yd run in the 4th quarter. While the Steelers play a clean game, the Seahawks suffer 2 costly 2nd-half turnovers and a botched an extra-point, forcing Seattle to have to go for a TD late in the game rather than a tying field goal. Seattle leads 9-6 and is driving late in the 3rd when Bryan Hinkle recovers a fumble at the Steeler 19. The Steelers then drive 81 yds in 14 plays, capped by Pollard's game-winner on a trap up the middle on the first play of the 4th quarter. Delton Hall picks of Dave Krieg on Seattle's next possession and after a Pittsburgh punt, the Seahawks fail on 4th and 17 and the Steelers muscle down the clock. A special thanks to Jay Korber for generously providing this game. Includes a 3rd-quarter helmet-flinging fight leading to the ejection of 3 players -- Houston's Doug Smith and Richard Byrd and Pittsburgh's Frank Pollard -- as well as the infamous post-game finger-wagging confrontation between Chuck Noll and slimeball Houston Coach Jerry Glanville. The Steelers come into the game tied for first place with Cleveland and have a chance to eliminate Houston help solidify their own playoff hopes, but in typical late 80's Steeler fashion, they can't close the deal. The game is ultimately decided in the red zone. Pittsburgh has the ball inside the Houston 20 five times (four times inside the 10) but comes away with only 1 TD and 3 FGs. In contrast, the Oilers drive inside the Steeler 20 only twice, but finish the day with 3 TDs and a FG. Moon completes 12 of 25 for 240 yds and throws 2 TDs to Drew Hill covering 52 and 30 yds. Hill finishes the game with 4 catches for 109 yds. Meanwhile, Mark Malone hits just 12 of 27 for 181 yds and is intercepted 3 times, twice by Jeff Donaldson in the 4th quarter. After Hill's 2nd TD reception makes it 24-16 with 5:20 left, Pittsburgh drives to the Houston 8, but a pass from Malone to John Stallworth bounces off Patrick Allen and Donaldson picks if off to seal the game. Features some nice pregame material. A special thanks to Jay Korber for providing this game. Scott Norwood kicks 5 FGs and the Bills score a pair of 3rd-quarter TDs in a span of 2 minutes to turn a competitive game into a laugher. The Steelers trail only 16-14 at halftime, but Robb Riddick extends Buffalo's lead to 23-14 midway through the 3rd quarter on a 4th and goal 1-yd run. Steve Tasker blocks a Pittsburgh punt 2 minutes later later and Riddick scoops up the ball and scrambles 5 yds for a TD to make it 30-14. Norwood adds 2 more FGs in the 4th quarter after a Darryl Talley fumble recovery and a Brister INT by Kelso. Trailing 36-14, Pittsburgh rallies with 2 TDs in the final 2 minutes following a Brister 1-yd plunge, a recovered onside kick and a 42-yd TD pass to Weegie Thompson. But a sloppy performance which includes 2 INTs, 3 lost fumbles and 2 blocked punts is ultimately too much for the Steelers to overcome. In a Sunday Night game filled with big plays and a lot of disdain between the two teams, Bubby Brister completes 3 TD passes, including picture perfect long bombs of 80 and 65 yds to Louis Lipps and a 16-yd game-winner to Merril Hoge with 20 seconds left to give the Steelers a thrilling 37-34 victory. Dwight Stone gets the big plays started for Pittsburgh with an electric 92-yd kickoff return for a TD in the 2nd quarter, followed shortly thereafter by Brister's first TD bomb to Lipps for a 17-13 halftime lead. Brister connects deep with Lipps again midway through the 3rd for a 24-13 Pittsburgh lead. Despite 3 Warren Moon INTs in the 4th quarter, the Oilers get back in the game on a 90-yd kickoff return for a TD and actually take a 31-34 lead with 1:30 left in the game on a 3-yd Moon TD run. But thanks to some terrible tackling by Houston, Brister drives the Steelers 80 yds in just 6 plays capped by the winning score to Hoge. A special thanks goes out to Paul Wood for generously providing us with this game!